It’s been a busy Saturday in Sydney as V8 Supercars weekend entered its second day. The day started with third practice session and continued with two qualifying sessions and two races in the afternoon. First, the qualifying session held in the morning which lasted just 15 minutes was dominated by Shane van Gisbergen who managed to achieve the fastest time of 1:30.2959. The time itself was a bit slower than yesterday’s results but good enough for the first place. Chaz Mostert and Scott McLaughlin were second and third with similar times. For full results, click HERE. The two qualifying sessions were very short, 10 minutes each, but quite interesting. The first one was dominated by Ford duo (Chaz Mostert and Mark Winterbottom) on first and second, but in third was Jamie Whinecup who had a disastrous 2015 season so far. 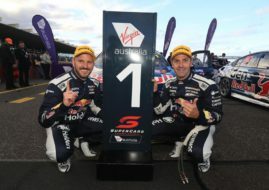 However, in the second qualifying session, Whincup scored the second best time behind Mostert and secured himself a place on the front of the row for the second race of the weekend. Jamie Whincup is in battle for first place, that is something we haven’t seen for a long time. For full results, click HERE.